PUBLISHED BY P.F. 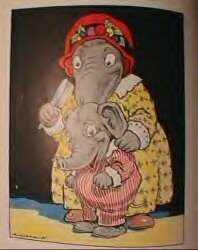 VOLLAND CO.
Henrietta Hennypenny and Eddie Elephant, produced by Beers-Keeler-Bowman . which were being produced by Volland. in 1921 with a 12 inch plush Little Brown Bear doll. which measured 14 inches and was made with a combination of cloth and felt. stating their "individual" patented name. The P.F.Volland Company sold the dolls along with the Sunny Book bearing their individual name, and was the original inspiration for the dolls. Ross & Ross continued to manufacture the dolls for Volland & Gruelle until 1923. The P.F. 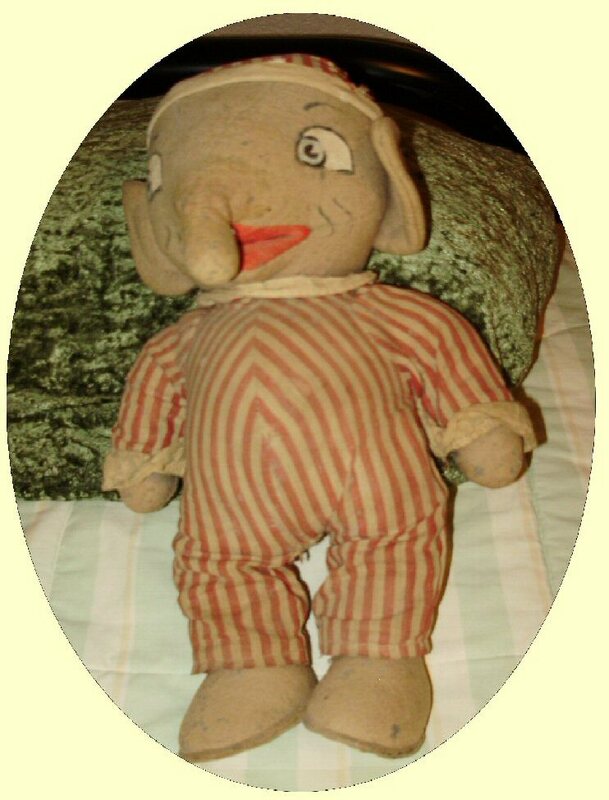 Volland Company introduced two versions of the Eddie Elephant doll. He is a artist signed, dated, & numbered edition. A handmade heart-shaped hang tag will be attached to doll. 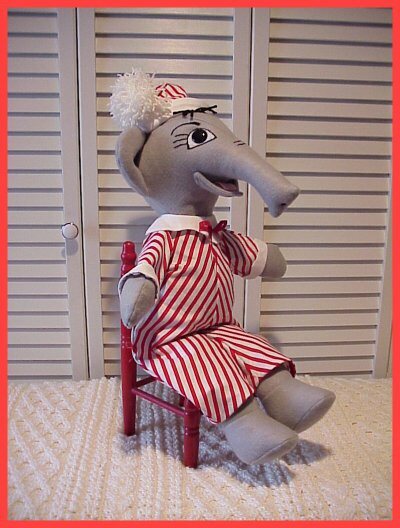 This little Eddie Elephant doll was a joy to create!!. 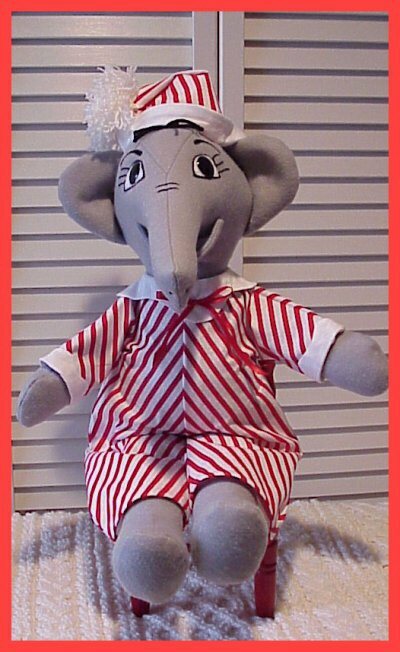 I chose a red/white striped fabric( which I use for the stocking legs of all my Raggedy Character dolls) for his removeable outfit…it is trimmed with white collar and cuffs. 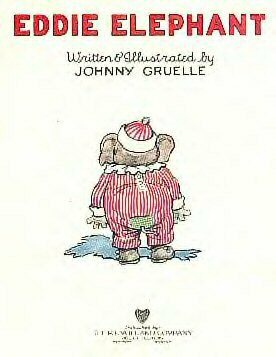 His little “BUM” cover is made of green/white checked fabric…………….just like in the storybook! I have tried very hard to match the “original” doll, from pictures in a variety of Raggedy Collectors books....as well as the storybook illustrations. Compare him to the picture of the original doll that is pictured with him below!! His lightly stuffed hat features a white yarn ball. I will soon be offering all of my character dolls in 15" and 10" sizes as well. 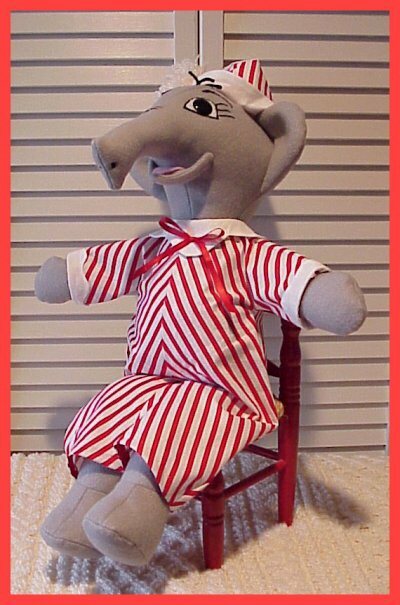 His head is formed of two back pieces and three front pieces to form his trunk………his large lightly stuffed ears are top-stitched…..adding a more finished look., and his head is sewn to his body at the neck. 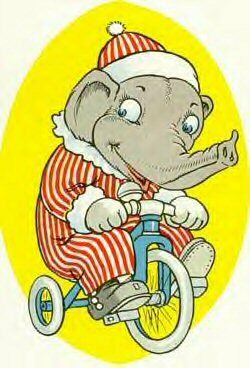 His legs are jointed at the hip and knee , so that he can sit. 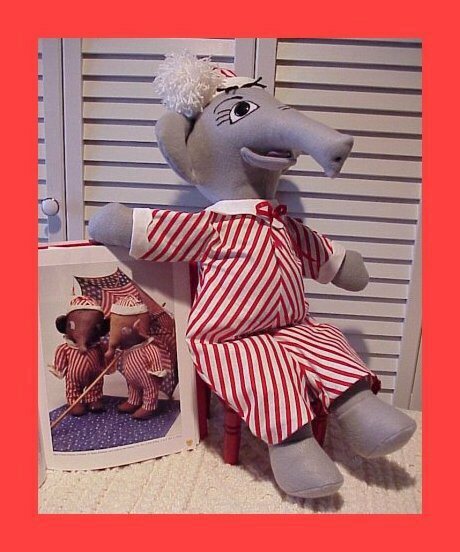 I designed my own pattern for this gray felt doll and his clothing from the pictures of the original “doll” pictured in several of my Raggedy Collector’s books. Although he is not an original……you will rarely see an “original” and they are “out of reach” for most of us………..so this is the next best thing! I think you will agree that the variety of character dolls I offer ….make for great conversation pieces and add a touch of “Variety” to your Raggedy Collections……..and can fill a spot until you are lucky enough to afford an “original” to take it’s place!!. 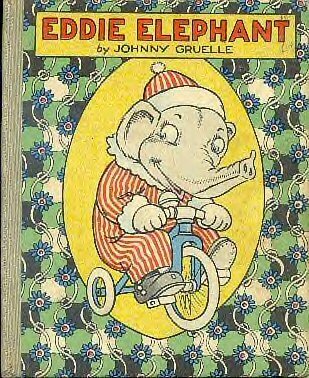 I hope that you will enjoy my version of Johnny Gruelle’s Eddie Elephant …Raggedy Character doll………I have tried very hard to duplicate the original. 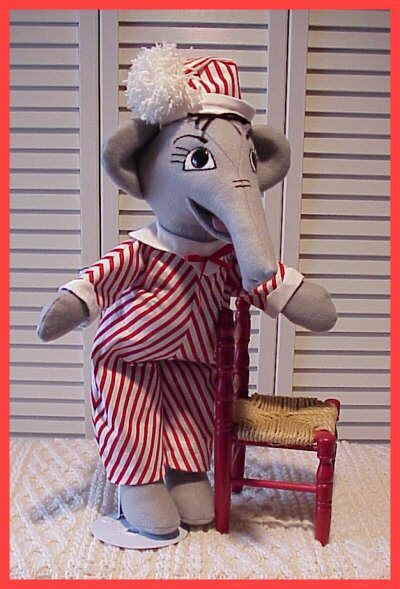 This Eddie Elephant doll is an Heirloom Quality Collectible Treasure that will add that one-of-a-kind distinction to your collection. 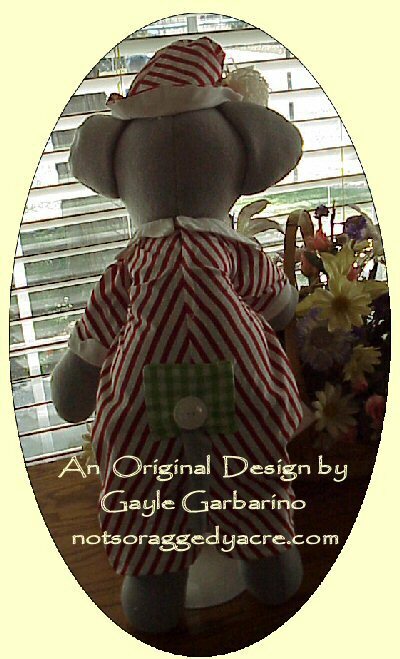 He is a delightful little “Elephant”…...Just waiting for someone to take him home to meet his new “Raggedy Ann family” and love him !! !